Diane Kochilas, celebrity chef, TV cooking show host, prolific cookbook author and cooking school owner, has been on the forefront of bringing healthy, delicious Greek cuisine to a wide international audience for many years. 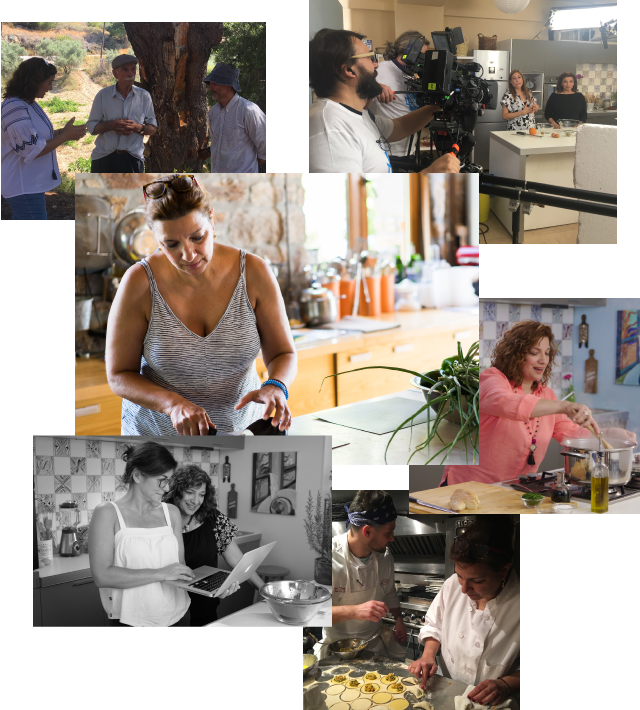 Her latest project is My Greek Table, a 13-episode per season cooking-travel show, which she hosts and co-produces. The show airs nationally on American Public Television and internationally in Greece, Canada and elsewhere. Diane owns and operates The Glorious Greek Kitchen Cooking School on the Blue Zone Greek island of Ikaria, and is consulting chef at the acclaimed modern Greek restaurant Committee in Boston. 01. A born teacher, every spring, summer and fall since 2003, Diane has run the Glorious Greek Cooking School on her native island, Ikaria, a Blue Zone, renowned for the longevity of its inhabitants, and for its untrammelled beauty. 02. Kochilas is an award-winning author of 18 books on Greek and Mediterranean cuisine. Her latest book is My Greek Table, Authentic Flavors and Modern Home Cooking from My Kitchen to Yours (St. Martin’s Press, December 2018). Her book before that, Ikaria: Lessons on Food, Life and Longevity from the Greek Island Where People Forget to Die (Rodale), won the 2015 Books for a Better Life award by the MS Society as well as the prestigious IACP award Best Cookbook award in the International Category. The book was also long-listed for an Art of Eating award. 03. The book before IKARIA, Country Cooking of Greece (Chronicle, 2012), was hailed by the New York Times as one of the 100 best books of 2012 and by virtual gourmet, John Mariani, as Diane’s “masterpiece.” Another tome, Glorious Foods of Greece (William Morrow), won the prestigious IACP Jane Grigson prize for excellence in research. 04. Diane has been consulting chef at Committee Boston, an acclaimed small-plate and ouzerie concept, since the restaurant opened in June 1015. As consulting chef, she has designed menus at some of the top Greek restaurants in North America, including Molyvos and Pylos in NYC, Axia in Northern New Jersey., Avli in Chicago, and Volos in Toronto. 05. Diane has also worked extensively in institutional dining, with Harvard University Dining Services, establishing a roster of healthy Greek menu items for student and retail dining; for Yale University Dining, and for UMASS, Amherst, renowned as the premiere college dining program in America. 06. In Greece, she was host of Greece’s most popular TV cooking show, “What Are We Going to Eat Today, Mom” (in Greek) and was a columnist and restaurant critic for 20 years at the country’s largest circulation daily paper, Ta Nea. 07. Diane has appeared on many major American television shows, most recently on FoxNews (Jan. 2014), as well as on “Throwdown with Bobby Flay,” “The Today Show,” “Martha Stewart,” “Bizarre Foods with Andrew Zimmern,” and more. 08. Diane divides her time between the United States and Greece. I am thrilled to be a presenter at the Culinary Institute of America’s first ever Global Plant-Forward Culinary Summit, May 1-3 in Napa. I'll be doing a cooking demo at the booths of several My Greek Table sponsors. Tune in soon for more info! Diane has worked with a long list of restaurants, retail food markets, and editorial and marketing entities to help shape the perception of Greek food internationally. She helped open Pylos Restaurant in NYC in 2004, and worked with the restaurant for a decade to serve forth rustic, elegant Greek cuisine, efforts which were rewarded with great reviews, top ratings in Zagat and many honorable mentions in the Michelin Guide. She has worked with Axia in Tenafly, NJ, and Avli in Chicago in the same capacity, helping to shape their menus. In 2011 she helped open Volos Restaurant in Toronto. HEPO. Diane worked with the Hellenic Exports and Promotions Board throughout the 1990s and up to 2008 as a consultant. The much-lauded GreekGourmetTraveler Magazine was her brainchild, a publication aimed at sharing the foods, wines and regions of Greece with an Emglish-language audience. Under her term with HEPO, she also spearheaded other award-winning publications, such as Simply Plated and Passport to Greek NY, all aimed at promoting Greek food and wine products internationally. CHEF’S CULINARY CONFERENCE “THE FUTURE OF FOOD,” UMass, Amherst, MA. with ARGO TRAVEL. CULINARY TRIP. Istanbul, Athens, the Peloponnese. JAMES BEARD FOUNDATION. Beard on Books. “Ikaria: Food, Life & Longevity” Presentation and signing. UMass, Amherst. Taste of UMass. St. Demetrios Church, Astoria, NY. NE Philoptochos Foundation Retreat & Book SIgning. Hattori School of Nutrition, Tokyo. US Congress, Greek Food Fest. Harvard School of Public Health & CIA, Menus of Change Conference.